Does dreary weather have you dreaming of sunny skies? Then consider a getaway to Las Vegas this spring. (OK, it just snowed there for the first time in years, but we're talking about later this year). As one travel blogging mom recently found out, it can be a very affordable vacation, even cheaper than a beach vacation due to lower hotel prices. They don't call Nedra McDaniel "Adventure Mom" for nothing. McDaniel publishes travel and shopping advice on her Adventure Mom blog. She had just returned from driving a giant excavator and bungee jumping off Las Vegas' Stratosphere tower when she shared her money saving Las Vegas tips with us. While some of those adventures can be pricey (especially if you have a family of four), she says it's possible to have an affordable Las Vegas vacation if you do some research first. McDaniel suggests you start by signing up for hotel and Vegas-related email newsletters. "Every hotel has a newsletter," she said. "And a lot of time you can find big savings in them if you sign up for that." To cut hotel costs, she suggests you stay a few blocks away from the center, despite the lure of the Luxor and Excalibur lights. "Off the strip tends to be less as far as costs," she said. "So you can save quite a bit that way." Example: While the newer Bellagio, New York-New York, or Venetian can cost more than $200 per night (with larger rooms going for much more than that), older hotels like the Flamingo and Westgate still have rooms for as low as $75, with online special rates as low as $39 per night. Even though the hotel may be older, all the big name hotels have renovated their rooms, and provide big cost savings over the fancier new hotels, McDaniel said. No one wants to spend all day at the slot machines (OK, some do, but they are not reading her blog). 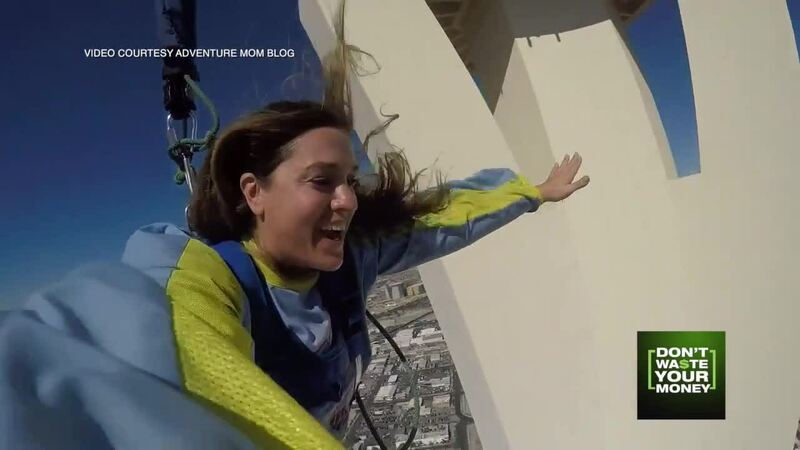 Activities like zip lining, construction equipment digging or jumping off the Stratosphere tower can cost a stratospheric $100 to $200 a person. But McDaniel says you should never pay full price. Look for deals on attractions at Groupon, Living Social and SmarterVegas.com, like 30 percent off tickets to Blue Man Group. To give your wallet a break, she suggests you visit free attractions like the Art District. "They have a great street art scene," she said. "There are street murals and performers and artists you can see, all at no charge." For dining, McDaniel says look for happy hour and later night dinner deals. She says many restaurants have big discounts before 6 p.m. and again after 9 p.m.
And again, look for deals at sites like SmarterVegas.com. As for getting there, the good news is that so many airlines fly to Vegas, there is great price competition -- especially with discounters like Frontier helping to bring prices down. And unless your airline uses points, McDaniel says it's important to shop around and compare those airlines, rather than just flying the major carrier you are most comfortable with. "Many of the airlines offer packages as well," she said, "where you can get the hotel room for almost nothing." And unless you plan several desert excursions, McDaniel says there's no need to rent a car. She says Vegas is a great city for walking, riding the Monorail and Ubering. As for when to go, McDaniel says spring is the priciest season. But if you don't mind hot weather, and plan to spend a lot of time at the pool or in the casinos, she suggests you visit Vegas during July and August, when hotel rates are lowest. CLICK HERE for more Las Vegas advice from her Adventure Mom blog. "So if you're thinking about doing it, just do it," she said.